Life is Good- Simple as That! Since it had been quite a while since I have posted on this blog I figured I would change things up seeing how that is all I have done this past year is see changes in my body & my life. I hope to be a little more punctual at posting and checking back her, feel free to leave me comments! You know how fun it is to get mail- :-) Anyway, I hope you enjoy what you see & read. Check out this blog: her give-a-way is for fabulous artist! Check out this new blog-she has a givea-way too! looks like I just might be a frequent flyer! and read about him. He is one special little boy. His surgery has been postponed for now but the cards are still important so go ahead and mail them to his teacher, her address is listed too. 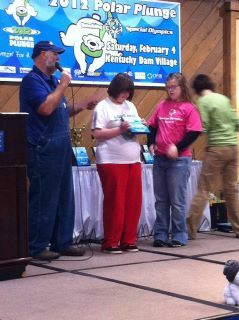 Yes, Our annual Polar Plunge was today to raise money for Special Olympics for Western KY. It was cloudy. It rained too, but not until all 513 plungers did their thing. But COLD? not really, the water (I was told) was 51 degrees. I, along with who knows how many others were officially TOO CHICKEN TO PLUNGE! We did our part by supporting them and collecting money for this fabulous cause! We even got T-shirts that say we were chicken! There were costumed groups and awards too. My daughter and one of her besties got to help hand out awards. You ask- Are they crazy? yes, some of them, sure, but most of us just know all the good that comes from this wonderful, annual event. We have only held it for three years and each year all totals from the previous year were broken. Was it a success? I'll say, today $91,000.00 was raised! Yea, I'd say this was a great day! Thanks to everyone that pledged, plunged, participated as an official Chicken, shared our link, volunteered and any other manner of support! Thanks-Thanks-Thanks & God Bless! I just found a new blog- looks pretty good- check it out! Ribbon Carousel has a cool new setup! The Ribbon Carousel© is made out of White Marine Board Plastic (High Density Polyethylene), giving it a textured top with smooth scrolled edges. Each Carousel comes with 8 Clear Acrylic rods allowing for many different configurations. You can use it as a 4, 5, 6 or 8 post Carousel, depending upon your individual needs. The Ribbon Carousel© holds up to 60 rolls of 3/8" ribbon using 4 rods, 40 Wooden Spools or 16 spools of your favorite Baker's Twine using 8 rods. It SPINS around on a lazy susan, allowing you to access your ribbon and twine easily! This easy-to-use organizer is compact, with a footprint less than 7" square on your workspace. The Ribbon Carousel©holds ribbon spools of any size up to a 4" diameter. Minimal assembly required. To use: Simply unscrew the knob on top of the Ribbon Carousel©. Remove the top and place your spools on the posts as desired. Replace the top by lining up the rods to the holes in the underside of the top. Replace the knob to secure the Ribbon Carousel. Specifications: Each Ribbon Carousel is approximately 6.85" square and 13.5" tall. The manufacturing and assembly of each Ribbon Carousel© is in Washington State, USA. How would you like to WIN one of the first Ribbon Carousels off the production line? There are 3 ways to enter. You can do one or all 4, it is completely up to you! Leave us a comment on this post. Visit us on our FB page and leave a comment there. Share about the NEW Ribbon Carousel on your blog and leave us your blog address so we can come to say "Thank You". Sign up for our Posts and Newletter on the left hand side up above. Drawing for the winner of a brand new Ribbon Carousel will be at 9pm EST Monday, January 30. FRESH off the SPOOL Friday! This week, we've got the newly released colors of the Twinery twine available in the store! Welcome 2019! New Year's Resolutions??? Super fast suppers...are you down?